If you’ve noticed thin, bare areas on carpets or rugs made with wool or silk, you likely have a carpet beetle problem. Keep reading to learn more about carpet beetles and how to get rid of them. The three most common varieties of carpet beetle found in North America are the varied carpet beetle, the furniture carpet beetle, and the black carpet beetle. All three have similar life cycles and habits. Adults are attracted to light, and may find their way into your home at night through an open window or door. They lay eggs in your carpet, because it is a food source for larvae. The larvae prefer dark places. That’s why you’ll most often see fiber damage under furniture. Synthetic material is not subject to damage from carpet beetles, since the larvae feed on animal products, such as wool or silk. Inspect the exterior of your home to be sure potential entry points are properly sealed and windows have tight-fitting screens. Consider having a screened chimney cap installed if you don’t have one. Reducing the number of flowering plants outside your home will reduce food sources for these beetles. In addition, changing your outdoor lighting from the standard white bulbs to the yellow “bug light” bulbs will help lower your chance for a beetle invasion. If carpet beetles have already found their way into your home, sanitation techniques can eliminate them. Thoroughly vacuum your carpets, as well as other interior textiles such as upholstery and window treatments. Vacuum behind doors, along baseboards, and any other areas where dust collects. Wash clothing, towels, and other fabrics in hot water and soap. 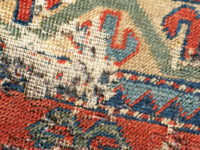 Have your carpets and rugs professionally cleaned. Carpet beetles can be persistent. If exclusion and sanitization techniques fail to eliminate them, there are additional measures you can take. Try using a preventative spray formulated specifically for carpet beetles. Be sure to follow the directions on the packaging and test it out in an inconspicuous area first. Sprinkle boric acid or food grade diatomaceous earth evenly on carpeting. These substances are safe to use in and of themselves, but harmful if inhaled. Therefore, keep children and pets away, use a breathing mask, and do not inhale the dust. Use a broom or brush to spread the powder as needed. Allow it to dwell for two hours, and then thoroughly vacuum. Have your air ducts professionally cleaned. If all else fails, hire a pest control company to apply the appropriate insecticides. Please feel free to contact us with any questions or concerns you may have about carpet beetles or to schedule professional carpet cleaning services as part of your prevention or elimination strategy.